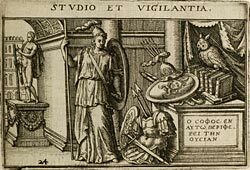 French Emblems: Emblem: STUDIO ET VIGILANTIA. STUDIO ET VIGILANTIA. pariat. Tota enim frugifera est, tota utilis, & voluptate plena. Promovet, armigerae praemia grata Deae. Noctuaque aggestos quae premit ungue libros. Study/assiduity and vigilance bring with them wonderful praise, the pleasing rewards of the armourbearing Goddess. The plumed helmet above the fierce shield denotes this, and the night-owl which presses with its claws (i.e perches) on the books which have been assembled. 1. Jacques Paschaire, humanist and physician to Henri de Navarre (who by 1593 was Henri IV, King of France). Emblem 31 is also dedicated to him ([FBOb031]), as is emblem 34 in Boissard 1588 ([FBOa034]). 2. The Greek text in the pictura is from Menander, Sententiae (Jaekel edition, 1964), Monosticha, 569. 3. Armigera Dea, i.e., Minerva.